In the past, much of the work on improved, biomass cookstoves has focused on clean cooking and increased fuel efficiency. However, top-lit updraft gasifier (TLUD) stoves are different from other biomass cookstoves, because they automatically make char as a by-product of cooking. Since char has numerous applications as charcoal and biochar, the TLUD stove becomes central to other activities, both in the household and in the wider community. This expanded function of the stove provokes a much broader view of its role in the economy. We call this view ‘TLUD-Biochar Ecology’. 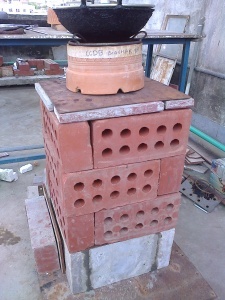 Presently, TLUD stoves are the only sustainable way of making biochar in the homes of rural Bangladesh. 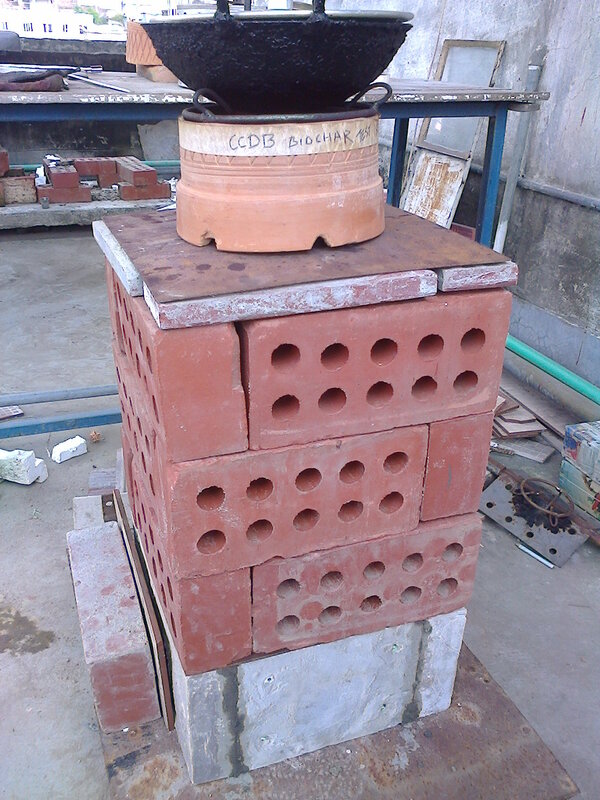 Char-making is proving to be a critical feature for public acceptance of this improved cookstove. Char-making is a keystone function¹ because it opens up other possibilities: (1) biochar is used for organic waste management and soil fertility to increases crop yields; (2) burning charcoal raises the overall efficiency of fuel energy use to >50%; and (3) char can be sold into the market to increase household income. In the community the char can be used as charcoal in a variety of small businesses (forges, tea stalls, restaurants), and as biochar in biotechnology (water filtration, waste management, fertilizers, etc.). Biochar plays the role of an ecosystem engineer² by creating long-term increases in soil organic matter, which increases soil productivity (soil biological activity, plant growth, soil water and nutrient relations, etc.) which will have a profound effect on providing ecosystem services for human communities. The simplified keystone effect of a char-making TLUD for a household. The wide arrow are material flows, and narrow arrows are effects. An early prototype top-lit updraft gasifier cookstove. We need “TLUD-Biochar Ecology,” as a type of human ecology, to understand and develop the keystone role of TLUD stoves in homes and communities. This is more than just a passive assessment of environment impact (e.g., life cycle analysis). People need to be actively engaged in developing uses for char. Through TLUD-biochar ecology, we can leverage the keystone role to (1) get wide acceptance of TLUD stoves into the 25 million households of Bangladesh that cook with biomass, (2) increase the income security of families, (3) maintain national self-sufficiency in food, and (4) develop other applications for char such as water filtration and remediation of salinity. At the same time, we have to consider the impact of TLUD stoves on the use of biomass fuels. Will TLUDs cause an increase in the price of wood, increase deforestation, and put poorer families at a disadvantage for buying fuel? Currently, more than 50% of the biomass fuel used is low density leaves and rice straw. To increase the use of TLUDs, we need new ways to make the dense biomass fuels that these stoves require. To introduce biochar for agriculture, the first challenge we face is not what to do with the biochar; the biggest problem is how to get biochar. We need locally-made TLUDs. Most imported TLUDs are not feasible in Bangladesh without subsidization (e.g., carbon credits). Only the well-off can afford them since they are made of stainless steel, have electric fans, and use pelleted fuel. For TLUD technology to be a practical option in Bangladesh, it needs to be naturalized. Naturalizing means adapting the TLUD technology to local circumstances, so that stoves are easy for local business to build, work on available fuels, and are culturally acceptable. The Akha Chula is a Bangladeshi TLUD. Naturalizing the technology helps to maintain national self-sufficiency in cooking. Both naturalized and foreign TLUD cookstoves will find niches in Bangladesh, but the naturalized ones will likely have the greatest initial impact. As TLUD-biochar ecosystems develop, there may be an increasing demand for fan-driven TLUDs, and commercial pellet fuels. The Akha Chula and TLUD-Biochar Ecology is being introduced to rural Bangladesh via Biochar User Groups. ¹ In ecology, keystone species [Wikipedia], such as elephants and beavers, modify their ecosystems to create new habitats and opportunities for other species. The ‘keystone’ metaphor comes from the key stone at the top of arches made of stone blocks. ² In ecology, “an ecosystem engineer is any organism that creates, significantly modifies, maintains or destroys a habitat. These organisms can have a large impact on the species richness and landscape-level heterogeneity of an area. As a result, ecosystem engineers are important for maintaining the health and stability of the environment they are living in.” [Wikipedia] Elephants are also ecosystem engineers.